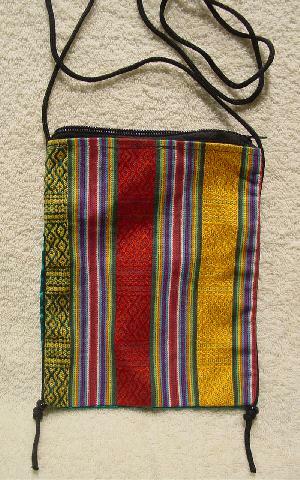 This fabric purse was made in Nepal. 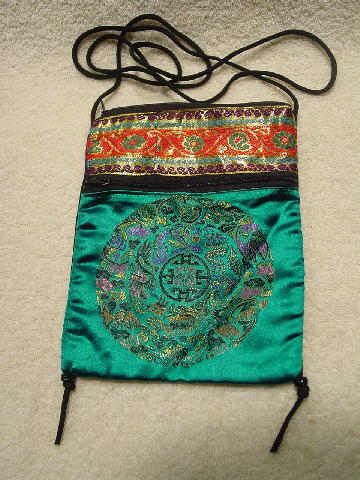 It has a front 3/4 length zippered Asian design section with a black see-through back panel. Behind it is a full length zippered center section with a back see-through black panel. Behind that is a full length open section with a multicolored wide and thin striped panel. It has a 50" long black cord shoulder strap. The bottom corners have a black bead and knotted cord. It's in dark teal blue, pink, peach-champagne, purple, red, green, and gold in the front and the back has green, orange, yellow, white, red, purple-wine, maize, and purple. It can be worn in the daytime as well - either side facing out. The color in person is more blue, not the green in the picture. It's from a stylist's inventory, and was used only once, in a photo shoot.